Worrying about your financial situation is common for almost everyone in the world. The price of transportation, housing, food, healthcare, and much more can be a very high daily cost. Worrying about financial burden is easily one of the biggest reasons people choose not to seek medical assistance after a car accident. It is extremely important that no matter how minor your injury is after an accident you should seek medical attention. Delayed symptoms are very common to occur after a car accident. When a car accident occurs, your pain may be minimal but, in a few days or weeks, it may be very severe. 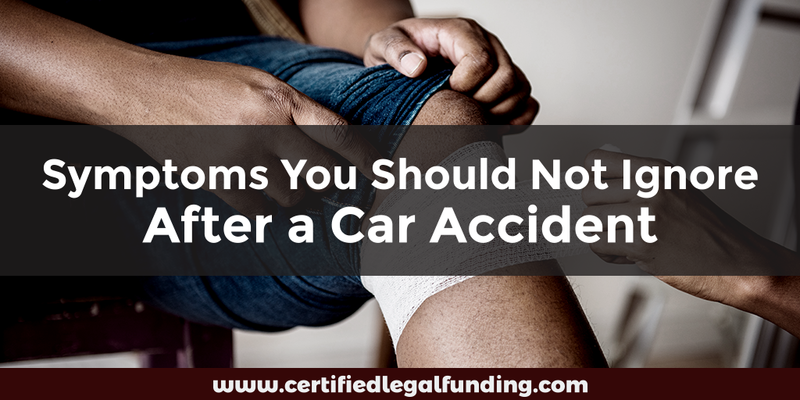 If you are involved in a car accident and it is not your fault, you may be entitled to compensation for lost wages, pain and suffering, and any related medical bills. If you never see a doctor right after the accident occurs, it can be difficult for you to receive the compensation you need. If you are worried that you won’t be able to pay the bills while seeking compensation for your injuries, legal funding is available. Legal funding will cover all of your medical costs, lost wages, and other life expenses while you are fighting for the maximum compensation you can receive. Legal funding is not a loan. If you don’t win the case, you don’t pay. Certified Legal Funding offers pre-settlement funding. That said, it is extremely important you seek medical assistance immediately after an accident. Back pain symptoms tend to progress overtime. Severe pain in the back can be a symptom of a sprain. Spinal cord injury is a severe injury that can result after a car accident. All of these symptoms can keep you out of work and not paying the bills. If you feel even minor back pain immediately after a car accident, you should seek medical attention. Car accidents are scary and extremely stressful. It is common for an individual to feel extreme emotions immediately after a car accident. For many people, the emotions will settle but there is a chance for severe emotional distress to occur overtime. An example of a delayed symptom of emotional distress is constant mood changes. The fact is, severe emotional distress is most commonly found in severe car accidents. In severe car accidents posttraumatic stress disorder (PTSD) may occur. Signs of PTSD from a car accident include constant depression, anxiety, scary thoughts, and more. The important thing to understand is, if you find yourself feeling extreme emotions after a car accident you should seek medical attention. Headaches are very common to occur in individuals after a car accident. Out of all injuries, headaches may be one of the most important injuries to seek medical attention for. Minor head pain can mean something serious. There are many different types of headaches, but any headache due to a car accident calls for medical attention. Headaches can be indicative of a concussion, serious brain injury, or even a blood clot. If you already have been in an accident and did not see a medical professional and are experiencing constant headaches you should seek medical assistance. First, it is important that you hire an experienced personal injury lawyer. Dan Zohar of DZ Firm is a personal injury lawyer based in Tampa Bay, Florida with over 30 years of experience. If you are worried about your finances, DZ Firm offers a free consultation as well as a connection to legal funding. Dealing with the cost of medical expenses as well as other bills during a lengthy legal process can be stressful. Receiving the compensation you deserve can take a long time. To benefit you, your lifestyle, and family – legal funding is available with Certified Legal Funding. Legal funding will cover all of your necessary bills while you fight for the compensation you deserve. Pre-settlement funding can help you drastically during tough times. If you find yourself in a money tight situation after being injured in a car accident, Certified Legal Funding is here to help. We will work to get you the money you need as quickly as possible. Remember, if you don’t win, you don’t pay. Call 1-800-922-7439 today!